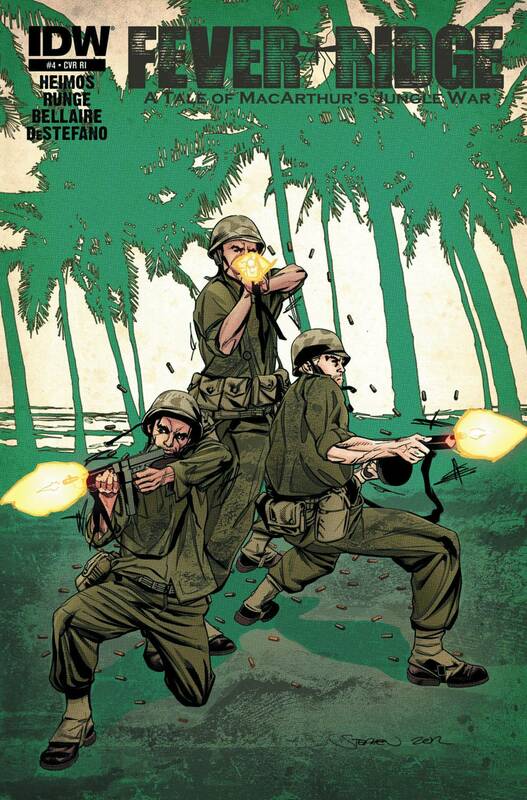 IDW takes us back to the jungle in the latest issue of Fever Ridge: A Tale of MacArthur’s Jungle War. 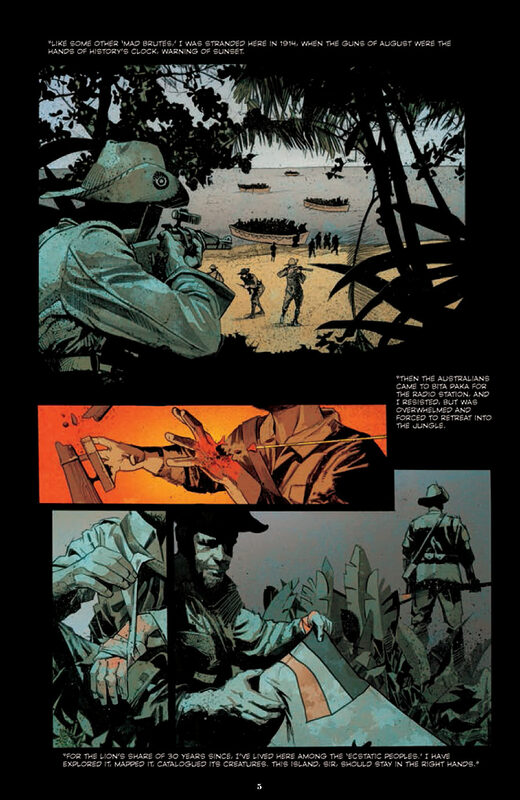 Penned by Mike Heimos with artwork by Nick Runge, this unique historical comic focuses on the U.S. military campaigns in New Guinea and the Philippines during World War II, topics not often broached in mainstream WWII fiction. 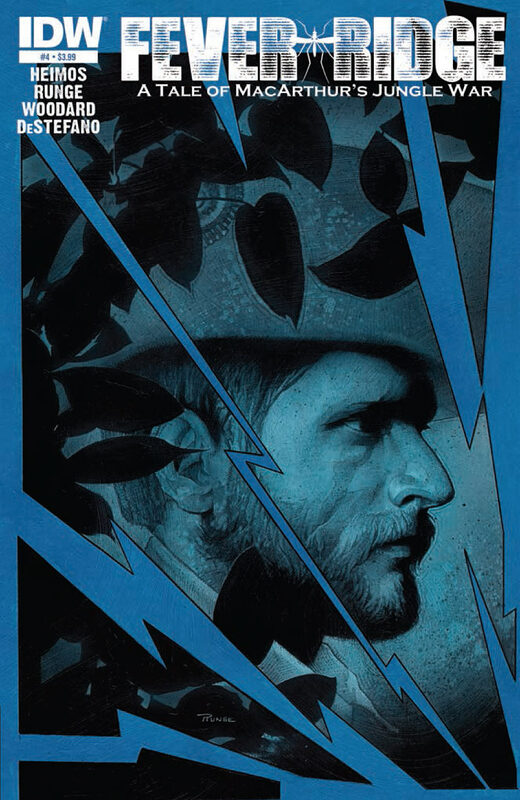 This series successfully takes on the familiar conventions of the genre and infuses them with literary sensibilities and elements of magical realism, creating a layered, evolving narrative that demands revisiting with each new issue. Heimos plays the long-game in crafting a rich and well-researched story, while Runge sees it through with dynamism and an incredible strength of page design. Issue #4 is no different. Here we see another successful intertwining of historical context with the tension of tight, character-driven scenes, punctuated by Heimos’ well-scripted dialogue. The introduction of the character Ruud adds another intriguing layer through the lenses of native politics and colonialism, further developing both the time and space. Runge expertly unfolds these scenes through the use of beautiful splashes and engaging panel transition and composition alike, complemented by color palettes of Nolan Woodard. There’s really nothing quite like this title on the shelves right now, a compelling read with an astounding visual execution that leaves the reader absorbed issue after issue. If you haven’t picked it up yet, I highly recommend doing so. With the release of this issue, soon to be collected in a trade of issues #1 through #4, I got a chance to catch up with Mike Heimos. You’re a writer of prose as well as comic books. For some that’s a difficult balance to maintain, while other writers thrive in both formats. How do you decide which format to pursue your stories in? Do you find yourself leaning one way or another? It can be tricky because the expected answer is, “when I want to see as well as read it,” it goes to the visual format, but that could apply to virtually any story. My decision comes down to answering whether it has been done in comics before, and, can the potential art + words outperform what can be done only with wordplay? When I was mulling and researching the concept that became Fever Ridge, the striking colors and landscapes, people, animals etc. of New Guinea cried out to be presented visually in order for it to be told properly, completely. As well, I could not find any comics or graphic novels that dealt with the New Guinea and Philippines campaigns, nor some of the other constituents of the book. Similarly, I’m also working on some medieval stories that will be nice to see in graphic novels or comics, for as far as I can tell, the subjects are new to the genre and they could look crazy slick. I’ve definitely become hooked on creating graphic novels/comics and look forward to doing several more projects, but am taking care to remain equally interested in writing traditional prose. Right now, I’m working on a series of short stories that are very GenX-ey. Since I’m a GenX and think our generation is fascinating, want to tell a few stories relating to us, some is even semi-autobiographical, what not. You’ve said in the past that Fever Ridge is meant to be read as a graphic novel. With that in mind, do you prefer the serialized format of comic books, or the immediacy and cohesion of the graphic novel? What are some of the pros and cons you’ve encountered? Obviously if the story is open ended, it’s a serial; if the story is finite, could be better to do as a graphic novel. The real trick is to decide whether to make a finite story into a limited series or a graphic novel. I’ve learned that unless one is absolutely sure the work conceptually is right as a monthly, and the team can hit the monthly publishing/printing deadlines (which we and plenty of others have trouble doing), it might be better to just make the book in graphic novel form. Or finish creating all the issues up-front, but that means undertaking a lot of work, expense, risk etc. and any income is deferred. Lots of people might find that too tough, but for me I think it would be much less stressful and in many ways better creatively. The “pros” of serialization include that you can make some sales, create interest incrementally, and you can tantalize. What’s a cliffhanger without a bit of a wait? As Fever Ridge was my first foray into comics and graphic novels, I did not know or fully appreciate the various release approaches, frankly I just assumed that it was the standard to serialize it then do trades etc. I cannot deny, if I could go back in time we would make Fever Ridge purely as a graphic novel, release when totally finished etc. Lesson learned! Yet there’s no doubt, still like the full novel format. And also, the trend for “art books” is something I’m digging a lot. A book World War II history buffs will love, Fever Ridge is dependent on a great deal of complex historical context. You’ve spend a lot of time building that up, devoting Issue #2 to this contextual backstory. As a writer, how do you find the right balance between plot/action with historical backstory? As a reader, how do you think that translates, given some of the magical realism in the story as well? Ah but let me point something out: as you will see when you read the trade Vol. 1 (issues 1 – 4), there is STORY in Issue 2 as well. It is not “just a history lesson” to paraphrase one reviewer. You will have to be a little observant (and patient… read into Vol. 2). But, story is there too! Similarly, page 14 of Issue 3 – there is STORY there. Your understanding of the book will be less complete if you overlook reading that fictional “Cockatoo News” edition. My take on executing a historical fiction, is to not balance between history and plot. You strive for a seamless weave of the historical backstory and world of the plot, with the plot. That is, it involves “world creation” just as much as a space opera like Star Wars or a Tolkien fantasy. Just as we, Earthlings of the 21st century, need to have Middle Earth laid out for us in sufficient detail and reference to be taken in by Bilbo’s story, so do we need e.g. the 4th century Roman cultural infrastructure to have a great story on Julian the Apostate (ref Gore Vidal’s Julian). Past eras are simply alien worlds, thus one succeeds in historical fiction not by making up places and re-ordering the laws of physics and the like, but through researching and laying out that world as thoroughly as possible. Now when we add a magical element to the tapestry, then things get doubly interesting. But it’s just another layer in the story. I think a lot about one of my favorite books, Salman Rushdie’s Midnight’s Children, which is a story of the not distant human past in the Subcontinent, and contains the magic of “superpowers,” including telepathy. My book is just a story of some complex men of a couple of generations ago, their WWII experiences and lives afterward, and it has an element or two of the magical (the main one being a character and the question of his origins and mortality). BY THE WAY, I wouldn’t dare say Fever Ridge is up to the level of Midnight’s Children! Just drawing an analogy to indicate what I’m aspiring to do – to present historical fiction that also has a magical element or two. Since the Fever Ridge trade will be coming out to collect issues #1 – #4, will there be any new material to entice readers to pick up the paperback? I asked Nick to color two of his spreads (#3 pgs. 10-11, #4 pgs. 2-3), only because the spreads were his real forte in the sequential art, they are incredibly killer and I wanted to see his own color interpretations of those. Know that I think Jordie [Bellaire] and Nolan [Woodard] have done GREAT work. A mini-album collects some photos and mementos from my grandfather’s WWII service – you will see various shots (and some that obviously reflect into the story) with explanatory captions. A set of annotations on certain panels from each issue, selected not-randomly and I point out some cool tidbits, e.g. a little trivia as to MacArthur’s silk robe (seen in #2). BTW there’s a little salute there to Brandon DeStefano, my letterer (who is not only doing a superb job in the book but also is a gentle educator and fine raconteur). In a section I call “Gobbets,” I craft some analytical queries for the readers, inviting them to re-look at the indicated materiel and think about the significance. Hopefully, some folks will be intrigued enough to get in touch with me on their thoughts, interpretations etc. (my Twitter account is indicated in the Intro to the bonus features). We made an art gallery, starting with a special pinup Nick created, inspired by a couple more of my granddad’s photos. Then, all the character/bio sketches from #2 and #4. I give a bibliography and an index. The bibliography is a proper one, but the index is more a fun thing than traditional. Still, these two pages are not to be overlooked – as with all the bonus stuff, there are important “reveals” to glean there, too! Finally, we show one Runge cover (#5) and a retailer incentive cover by Leila del Duca (#7), and some teaser info for #5 – #8 (Vol. 2). Fever Ridge is a unique and complex war story with elements of the magical and the strange. As a writer, what is your aim with Fever Ridge? What would you like your readers to take away from it in the end? Right, it is fairly complex… and I am definitely not writing it for everyone. The fact is, as your question presumes, I definitely do want readers to TAKE AWAY some things. Generally the work has gotten good to great reviews, and some of them actually insightful. But yes, there has been some negative commentary, “This is boring!” and such. OK but here is a basic point: this book is not a shoot ‘em up in the first place. Also, it is not a rah-rah patriotism piece. My aspiration is to make something for a perceptive reader, who has patience and can both notice and savor details, layers, subtleties as well as explosions, wants a developing story and character evolution, is interested in historical fiction. To date, we have been laying lots of groundwork – and still showing some action! Anyone who says, as did one reviewer, “nothing happens [in Issue 1] …” is just blind. The sniper cliffhanger, that’s nothing? Another example – the swamp firefight in #3, that’s nothing happening? C’mon! With that said, I will tease you and the readers like a prom date: there is some incredibly extreme “action” later in Vol. 2, I assure you. Example, and as our good fans will guess from reading the first issues: Issue 5 is a recon/rescue with a twist. ‘Nuff said. I’m trying to make a book that I want, pure and simple (and there are some people like me, I think ;-), a book that one revisits after the first for a second, third reading, a couple of years later and such. It is not for someone who wants “POW!” on every page never to return to the work. I’ve nothing against them, mind you; it’s just that I’m writing this for someone else. The book is made in homage to my grandfather, and the Erik character in part is thought experimentation to understand him better. Thus I want to document his perspective; and maybe connect with people of my generation, perhaps our parents and our kids, whose fathers/ grandfathers/ great-grandfathers may have had similar outlooks. Moreover, there definitely are philosophical and political ideas, issues woven into the story, stuff that not a lot of today’s readers have considered at all and especially in the context of WWII and the ‘Greatest Generation.’ You saw some of this beginning in Issue 1, in the first conversation between Franz and Erik; it’s elsewhere too. Of course, these issues are the more gravely considered during war, when a society tells its young men to kill another’s young men, by the bushel. There is a gap in the fiction of WWII in that the New Guinea and Philippines campaigns have gotten short shrift, and this book is to make a contribution there, too. Relatedly, another goal is to increase awareness of New Guinea, its people, flora and fauna – it is one of the last true gems of the world, such places are being sterilized and eliminated daily. Again, I want to offer something to those that really enjoy the element of magic-realism, and who would like to stay with it in my other work. I think for example of Herbert’s Dune books, which have strong magical elements that connect all the subplots and eras. My magical elements include at least one that will connect to other of my projects. In my research, I came across some cool “holes” in the history that gave me the opportunity to include a mystery element as well. In Vol. 2 you will be taken to Fever Ridge and see what it might mean for the Sightseers, and the world. Finally, I suppose I just wanted to contribute to an emerging genre of historical fiction in graphic novels and comics. As I’ve said elsewhere, I’m a fan of Brian Wood’s Viking stories, Jordan Stratford’s Crimean War steam punk book (and his blog btw, WOW), and others. Before you go, any parting thoughts? Any other news you’d like to share? Hmm just come back to me in a few weeks, there may be some additional news as I’m cooking something up at the moment, but it’s too preliminary to discuss! Also, get out there and support other creator-owned works! Thanks again to Mike for taking time to talk, and we hope to hear again about this book in the future. Mike Heimos is the writer and creator of “Fever Ridge: A Tale of MacArthur’s Jungle War” a very unique comic that is published by IDW. This might be his first published work in the comic book industry but definitely not the first time he puts a pen to paper to write, he’s been doing it for years! So we are glad that he has given as the chance and time to answer several of our questions so we can know more about him as a writer with a unique technique, about his comic book and possible future plans. Q: First of all I would like to ask when did you start writing and when did you finally decide to pursue a career in creating comic books. In those days I lived in Denver and was a huge, devoted Battlestar Galactica fan. During that beer-and-brainstorm weekend, in Sunday’s newspaper there was an advert indicating that the Starfest con in Denver was welcoming Katee Sackhoff as one of the celebrity guests. She was (and is) one of my favorite TV actresses, and I bought the con badge. On arrival I learned that the comic book folks had a con in tandem with Starfest, so I popped over to see what the comic-con was all about. I had not been a devotee of comics, but I’m a curious guy, love learning new things, and at the con there were seminars about comics creation, writing, and other stuff that tickled my fancy. My first level was to think about illustrated novels and novellas, sort of like a Mark Twain or Arthur Conan Doyle things, and the concept just grew that some of my ideas would be very slick as full on graphic novels, in the right hands of course. And one of those ideas was the WWII story that was inspired by my grandfather’s service in New Guinea and the Philippines. And now, I’m quite devoted to building a career as a writer, both in comics and graphic novels, and in ‘traditional’ writing. Q: Would you like to tell us a few things about your site Kingfishergraphicarts.com on why did you start it, what are its purpose and its aim? I have loads more writing in my computer, waiting to be liberated! Most are not, but several other concepts would be slick as comics – other historical fiction, a huge space opera, a dystopian-future tale of a USA with a Stasi-like agency, a few comedies, etc. Q: Fiver Ridge: A tale of MacArthur’s Jungle War is you first published work, was it also you first choice to pitch to a publisher? It was not necessarily the first choice in my mind and heart back in 2011/12, but it just sort of happened that way. Right when Nick was finishing up Fever Ridge pitch pages, Tom Waltz at IDW saw his portfolio at San Diego Comic Con and he expressed serious interest in getting a pitch, so we did it. Since Fever Ridge connects inter-textually with two other work I will create – Red Forest, which I mentioned earlier, and Gilded Steppe – but it actually comes last in historical chronology (Red Forest is set in the 13th Century, Gilded Steppe in Classical times), you might expect that I’d have started say with Gilded Steppe. But again, opportunity knocked as it did. Q: How did the collaboration with the rest of the creative team on Fever Ridge come into existence? At the Denver comic con mentioned above, I attended a great seminar with Nick on the dais. I approached him afterward about availability and whether he would consider collaborating on one of my ideas. He asked for summaries and in a few days he indicated being most attracted to the WWII story. And wow, am I glad he was! Then Nick found Brandon DeStefano, who expressed keen interest in lettering; and Brandon got hold of Jordie Bellaire, who wanted to color. Then Jordie was wooed by Darkhorse and had to jump on an opportunity there, so she secured Nolan Woodard for us. Q: You have mentioned in the comic book that a big influence for Fever Ridge is a story said by your grandfather based on real life facts, so are there any other influences both from real life and fiction that you brought into the story which played a major role in forming it? There are lots, lots of influences from reality and fiction going into the creation of Fever Ridge. One of my secondary historical sources is a nice piece called “Silent Warriors” by Lance Q. Zedric, a history of the Alamo Scouts (see issues 2 and 3 of Fever Ridge); another is a cool history/self-propaganda, Four Years Among Cannibals by the enigmatic Hermann Detzner, an explorer of New Guinea prior to and during World War I. As for fictional influences, well I am with Umberto Eco in arguing that basically all the literature one experiences in their past reading goes into the literature one creates. But I can tell you that some things that specifically influence me in making Fever Ridge are going to appear in Fever Ridge Issue 4, literally for you to see, and other influences include stories such as Saul Bellow’s works Ravelstein and Henderson The Rain King, and… others! I think in the final trade paperback I’m going to provide both a complete bibliography and an exegesis essay that will sort of “line by line” reveal all the little elementals for the story and the ideas presented, because Fever Ridge is pretty complex and layered. Let me say that, for example, what many people seem to be thinking is the strictly history lesson of Issue 2 is BOTH that and fully part of the fictional story. So do NOT dismiss that chapter as “yawn, a history lesson,” if you care about fully understanding what happens with the characters. You will want to pay attention to Issue 2. Q: In the first three issues of Fever Ridge anyone can see you have made tremendous research to the point it’s like reading a comic book documentary of that era both in history and environment. So how much of your time did this research consume and are you still researching for the following issues? Indeed the research is constant; it really never ends until the book is off to the printers. I’m always re-thinking and re-reading and re-considering, and the underlying aim being not necessarily exact accuracy but plausibility, at least to the elements that call for historicity. But as I’ve said in other interviews, there too are magical realism aspects in Fever Ridge and thus, that stuff will be plausible assuming the existence of a little magic in the universe. Q: Both story and art wise Fever Ridge is being told in a unique way! In many ways the story seems like it’s more like a statement of events, is this your usual writing style or is it “designed” this way specifically for this comic? My “usual writing style” is fairly versatile, ambidextrous. But yes, we are aiming to be pretty unique in Fever Ridge. The art style, the color choices, messing with the time/space continuum, here and there breaking the “180 degree rule” to intentionally create surreality/disorientation (Nick and I are huge admirers of Stanley Kubrick, who did this a fair bit, e.g. famously in The Shining in the bathroom scene), not pulling punches on the gore, etc. Well, you’ll need to wait until Issue 8. Q: How much input did you have in Nick Runge’s, Jordie Bellaire’s and Nolan Woodard’s art? Essentially, I write a play and therein give Nick stage directions (I explain this in some detail in Issue 3’s essay), and he gives some directions on colors to Jordie and Nolan. Q: Are you satisfied of the final outcome in each issue’s form up to now and if you had a second chance would you change anything? I think it’s no slight at all, to any of the visual artists, to say that the issues, the covers, etc., never exactly match what I had in my own mind. I think it’s a fool’s errand to expect that the writer/creator’s idea will fully, exactly become reality on the page (this is of course when, as here, the visual artists and the writer/creator are not the same person! but even then?). Yet this does not mean that one cannot achieve satisfaction. Indeed, to date I’m quite satisfied because the essence of my scripts have been made real. Sure, there are aspects of the art, and my own writing, and the lettering that I would change or have changed if given the opportunity. But that’s the way of things! You have to understand, that Perfection as a goal and a process, but something that can never really be achieved. As a fan of jazz, “the imperfect art,” I know that imperfections add depth and it seems to me that actually achieving perfection would be a bit of a tragedy. Author Mike Heimos with friend, Lucia Notte. Q: Is Fever Ridge a onetime story or is there a possibility of seeing the main cast of characters in a future limited series? As to the main cast, it is intended to have finality at the end of issue 8. But, as the saying goes, I will “never, say ‘never’.” Never is a long time! It’s quite possible that a true “spinoff” can spring from Fever Ridge, quite a few angles come to mind. By the way, I’m already on record – in Issue 2’s supplemental materials – disclosing that Franz will die in the War. Indeed, he will. As for the other main casts’ survival, you will have to see. I’ll repeat here another disclosure that I’ve given in other interviews, that one of the characters is the vehicle for intertextuality that connects Fever Ridge to Red Forest and Gilded Steppe. Perceptive readers should be able to glean who it is, pretty soon. So this is it thank you Mike for taking time from your schedule for this interview! Thanks! Fever Ridge is a limited series of 8 issues published by IDW, last week issue three of this title was released. So I think it’s about time I made a full review for this comic which its story and set up has been made in a unique way and which to be honest at first had me confused. It’s not the type of comic I’m accustomed to reading, but when I stopped analyzing and comparing it to all the mainstream comics I used to read I really enjoyed it and saw what a good read it actually is. The story takes place in Papua New Guinea during World War 2 as we see a group of soldiers mature and change from wars hardships and the situations they have to deal with in an unknown dangerous environment but exotic too. The main influence for Fever Ridge is the real events of the writer’s grandfather who had lived them during this war. Mike Heimos is the creator and writer of this comic while the rest of the creative team consists of Nick Runge who does pencils and inks and Jordie Bellaire who after issue one passes her duties as colorist to Nolan Woodard. As I said before I was taken aback on how Mike Heimos had setup and wrote this comic. It’s more like a comic book documentary if something like this can be said because actually Fever Ridge is two things. One part is the comic and the other is a narration of documents, essays and thoughts of the writer. Each part can stand alone but it would not be as interesting and intriguing if you don’t read it as a whole. What I mean is that the comic is interesting with its art and story but the “extras” give you a general feeling of the environment, conditions and thoughts that Heimos wants to put out there for the readers to know. This way the extras make you appreciate and understand the whole comic aspect of Fever Ridge even more. Also Mike Heimos has made a tremendous research to build this comic. This is obvious and you can see it in the way he has built both the environment the story unfolds in and the personalities his heroes’ have. In issue one where all his main characters meet in the 6th Infantry in California the conversation between Erik and Franz although through simple and everyday talk it reveals more of their personalities and the concepts, perceptions of the societies they lived and live now. In issue two we see in a detailed historical comic narration of the main events that lead Japan in the late 19th century to start an aggressive colonization of the Pacific up to WW II when General MacArthur states that he will fight back and win the Philippines. 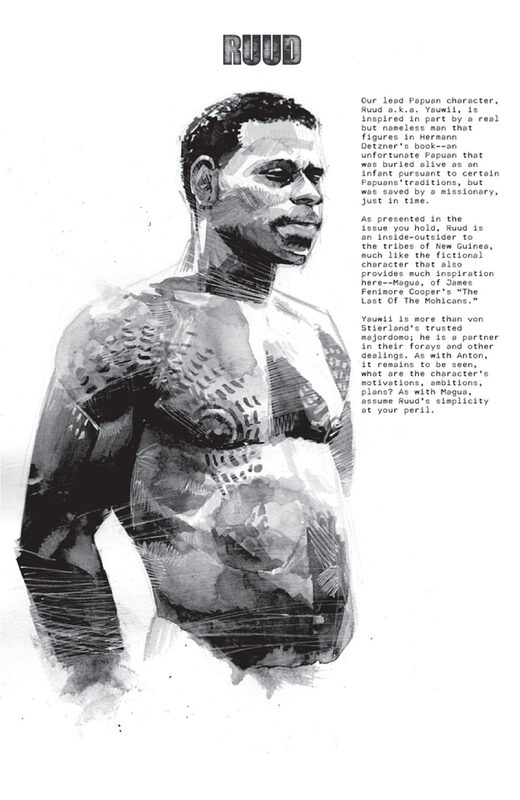 Even Papua New Guinea is fleshed out with specific details about its environment, culture and history in all three issues. Essentially all this research has succeeded in bringing you more into the story and making you understand the forces which are in the background and pulling the strings of the lives and destinies of the characters that are featured in this comic. The characters also will have to deal with a mystical element which Heimos has confirmed will appear in the story as well. This element is seen from the start of the series and becomes more obvious by issue three but still it hasn’t been reveal to its full degree. I do not want go in details on what this magic element will be and how it will affect the characters because at this point it will be only speculations and will spoil the whole story anticipation. I will only say that it must have to do with a common experience that Erick and the third main character of Fever Ridge Blackie had shared in the first issue. So apart from the raw battle action we will see a deeper mystical and perhaps spiritual aspect to the story that it only makes it even more entertaining. Also a great aspect in the story is the environment of Papua New Guinea and how it’s visually shown. Nick Runge has done a brilliant work of visualizing Heimos detailed research into Fever Ridge especially when he has to draw parts of Papa New Guinea’s natural environment, landscapes and animal life. His art is detailed and full formed and his inks add a shadowing element that make it realistic both in the panel sequences as in the splash and spread pages, in general you can see he has a background of traditional training in visual arts which grips you and makes you a part of the story. Jordie Bellaire although for one issue has also done a great job in coloring you can see this in the very first spread page of issue one, she uses specific colors and tones to add to the atmosphere just as Nolan Woodard does in the following two issues. Woodard’s coloring becomes even more dynamic by issue three his tones and color choices add to the art giving you a vivid feeling of the atmosphere you can actually sense the heat and humidity of New Guineas environment. I have to say as a whole the art is simply awesome! And he succeeds in doing this at least for me, in each issue he reveals details of this islands history and how it has struggled throughout the ages, on how it was and what conflicts have arisen in the present and in what dangerous it will lead it in the future. He also gives information about the wild life of New Guinea and its importance. The extras also include original character designs and essays about historical events and even on the origins of several words. All this add to the comic and as I already said makes it all the more intriguing. If you haven’t read yet Fever Ridge I would strongly suggest you do. It is a comic of action and historical interests and as the story unfolds the plot thickens and the art becomes even better. It really is a good read with a different approach on how most comics are done which only makes all the better entertaining and unique. Read it and you will see. This Monday I continue with an interview with Mike Heimos the creator and writer of this comic. He answers in several questions about comics and future works.